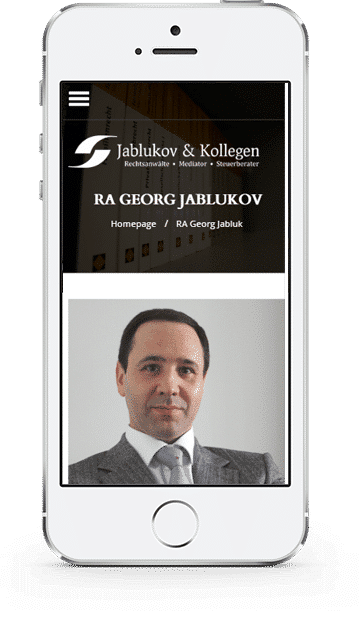 Georg Jablukov is a well-known and established Berlin law professional, who needed a new website to support his business expansion to abroad investors and businesses. The old corporate website needed a major design face-lift and capabilities update, in order to be able to support the new business goals in an appealing and technologically sound way. Ristretto held several meetings with the client's team to gather the requirements from the stakeholders across the organization. After the research and creative brainstorming within the agency, the resultng specification document was presented for the client's approval. The result of that client-centric approach is the visually appealing, technologically advanced website that supports the law firms' new and existing business goals in alignment with individual stakeholders requests. Ristretto held several meetings with the client’s team to gather the requirements from the stakeholders across the organization. After the research and creative brainstorming within the agency, the resultng specification document was presented for the client’s approval. The result of that client-centric approach is the visually appealing, technologically advanced website that supports the law firms’ new and existing business goals in alignment with individual stakeholders requests.